First and foremost thank you all for your support, everyone who donated, asked about the training, the race and wished me luck really helped motivate me toward finishing my first race back. Thank you. To Staci: my endlessly devoted, supportive girl friend. I cannot thank her enough for the hours of care pre operation, post op at HSS, recovery at home, for helping me achieve my goal, and even tie my shoes. None of this would have been possible without her, she is my limitless, my continuous presence, my core, passion, and soul. I love her for all these reasons and more. Friday afternoon after leaving work I headed off to packet pickup at the Hilton Hotel in midtown. Attending the athlete briefing the athletes got their final race instructions and race numbers. We mingled with pro athletes and enjoyed the freebies and new product demos at the race-expo. We all joke that we race for the free shirt, hat, or swag bag! My race number was 4446 easy number to remember and with temporary tattoos of the race numbers for body marking I was sure I would get some great race photos. (the photos below are from our iphones, official race photos will be available next week). That night I followed my pre race routine, eating a healthy dinner, watching an uplifting moving, and going to bed by 9pm. Wake up call for this race was well before the rooster would consider waking up. Before I laid my head down to rest, I took one final look at my training log, reminded myself the hard part was over. The hip surgery was behind me and tomorrow was the fun part, all the hard work, long hours and dedication would pay off! lights out. Sunday am started early, I woke up 2 minutes ahead of my alarm. I guess my body knew it was GO time! making my way to the west side to begin my morning I passed a few late night partiers who looked at me funny, which always makes me chuckle. Either way once near the west side I set up my transition area, all my bike gear laid out my running stuff just next to it and ready to go. Luckily I brought a head lamp with me, as my transition slot was in a dark area and at 450 am without the sunlight I would have to feel my way around. I made exceptional use of the head lamp and quickly got myself situated. 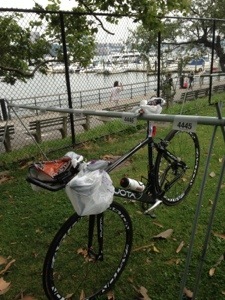 I prepared myself to walk to the swim start, wetsuit in hand, nutrition and liquids in the other. one final look at transition and I was off to start my first triathlon on my new hip, and hopefully complete my 23rd triathlon since I began four seasons ago. If you were wondering how do they get 5,000+ athletes into the Hudson and back out safely you can see in the below photos the swim platform pre-race with the flags, then the athletes all lined up before the start of the 1.5k swim down river to another swim platform where volunteers assist triathletes out of the water and up the dock onto the swim exit timing mat and off to T1 (transition 1 swim to bike). 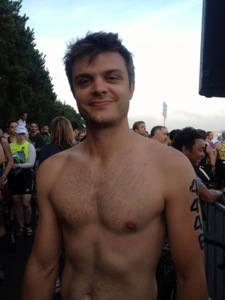 My swim wave started 25 minutes later than scheduled, this is nothing new for the NYC triathlon but I will say this was thankfully the first race in several years where the swim went off without any catastrophes. About 400 meters from the swim exit a kayaker (safety lifeguard) cut across the swim course right in front of me, which I couldn’t tell as the water clarity was so low, this resulted in me swimming directly into the kayak as it made its way to a swimmer in need of assistance. Always a good swim if I can get knocked around. The current in the Hudson permitted many first time athletes to simply float down river to the finish and usually a bag of Dorittos does the swim course in 28 minutes so if you were to just float down river you pretty much would finish the swim in roughly 30 minutes. Post hip surgery I developed my swimming more than ever before, I was confident in the Hudson and completed the swim in 18:55 (if I hadn’t been mowed down by the life guard on the kayak I might have had a slightly faster swim. Running into T1 I quickly found my bike amongst the thousands of bikes racked in transition (which if you get lost or disoriented can be a really stressful transition). 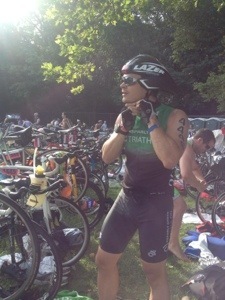 I got my bike gear on, helmet clipped and I was out of T1 as quick as possible. While making my way out on the 28 mile bike course I found space amongst the other triathletes to settle into a constant speed and push a comfortable gear while keeping an eye on heart rate, to prevent spending myself from blowing out my legs on the bike. I probably spent more energy on the bike than I wanted but I came off the bike with a strong time and managed to take in as much nutrition as I could stomach, which honestly is one of the tricks to racing. I ate two salt tablets, an entire power bar plus three GU packets and drank two 28oz water bottles filled with Ironman Perform (a more effective blend of carbo-hydrates than simple Gatorade). I wrapped up the bike averaging 20.4/mph covering the 28 miles in 1hr and 13 minutes. I hopped of f the bike and re-racked the bike to turn around and head out on my run. The course for the run is a fun one, starting along the Hudson river and heading east toward Central Park along 72nd street. The number of fans and supporters that come out is amazing, the race and triathlon grows in popularity every year. With fans lining the barricades along 72nd the cheers, posters, applause and constant ring of cow bells carried everyone into the park. To honor my promise to SUPERJACK after raising 2200+ dollars for Children’s Tumor Foundation I wore a superman shirt for SUPERJACK! It was possibly one of the best emotionally fulfilling run’s I have ever had, fans all over the course (kids and adults the same) cheered extra loudly for SUPERMAN aka SUPERJACK. I don’t think I ran a single mile of the course without a smile on my face!!! I have never had such an amazing experience. As athletes entered the park they turned north heading up the west side of Central Park encountering hill after hill. If you have ever run in Central Park you know that Harlem Hill and Lascar Hill are killer especially mid run during a triathlon.These seemingly endless climbs challenge even the best of runners. With my running being the weakest it has been in years as I felt under-trained for this race, coupled with the short recovery since my hip replacement being only 8 months ago to the date I struggled in the heat. I ran slower than I expected and finished the 10k in 57:30 possibly one of the hottest runs I have had in a long while. To battle the oppressive heat I continuously took in liquids and GU, plus two more salt tablets. 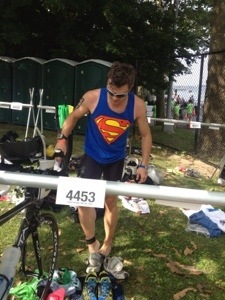 I was pouring sweat by the finish line, and gave hugs to everyone who was willing to accept thank you hugs from a sweaty SUPERMAN triathlete. Total race time 2:37:01 a PR on a new hip, a great race day, an amazing experience and a platform to build from for my next race, which is TBD for now but you can rest assured it isn’t short course racing like this, I want that M dot, and for those who want to know what that means, it is going after the 140.6 mile race day. My9- Sat 8/3 @ 5:00pm! 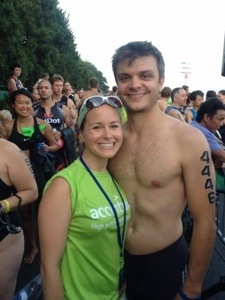 This entry was posted in Goal, Journey & Life of Triathlon, Nutrition & Recipes, Purpose of this Blog, Race Update, Support Crew, Surgery and tagged CAF, Children's Tumor Foundation, CTF, hip replacement, HSS, triathlon. Bookmark the permalink.